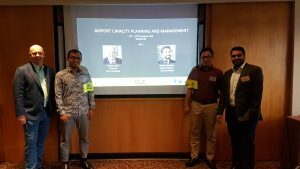 The Airport Planning Capacity Management Course, facilitated by EquipGlobal and based on IATA standards, was extremely well received by attendees, who highlighted in the course feedback the focused approach, wealth of knowledge and excellent coaches from AiQ Consulting. Delegates also learnt how to manage demand peaks and troughs including busy periods or changing schedules, utilise resources more effectively and gained an insight into the unique power of data analytics and advanced simulation for making strategic airport decisions. With an Engineering and Business background, Adrian Todd has worked in Heathrow, Leeds Bradford, Hyderabad, Budapest, Sydney, Manchester and other major airports for the many years using his project and stakeholder management skills to increase capacity and create operational efficiencies in the projects. Using their AiQ experience, Adrian and Mevin worked with the attendees to offer practical advice, guidance and support to people involved in capacity planning and operational efficiency within the airport industry including hub, regional, low cost and pop up airports. The attendees also benefited from discussing their own airport planning and capacity management plans in a group environment, as well as looking into industry trends and insight into the relevance of data analysis. If you want to find out more about Airport Capacity Management, take a look at our services and case studies or contact us today.